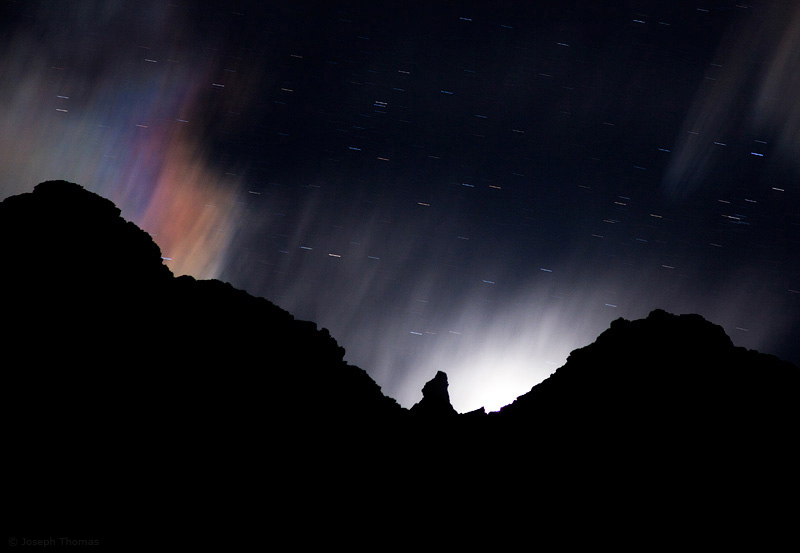 This rare phenomenon, known as a moon dog or circumhorizonal arc, is caused by light passing through high-altitude cirrus clouds. The sight only occurs if the cloud's hexagonal ice crystals are shaped like thick plates with their faces parallel to the ground. If the crystals are aligned just right, the whole cloud lights up in a spectrum of colors. Normally only visible during daylight hours (known as a sun dog), this circumhorizonal arc was invisible to the naked eye. I was photographing an interesting ridgeline at the spot where the moon had just dipped behind the horizon. Not until viewing the camera's LCD screen after the 30-second exposure did I realize I had captured the arc. It was purely fortuitous that the outcrop in the saddle almost appears to be the silhouette of a dog howling at the moon.